While the last act of the 'Novichok' drama, the seasonally appropriate resurrection of the Skripals, proceeds, some additional details of the history of 'Novichok' nerve agents come to light. 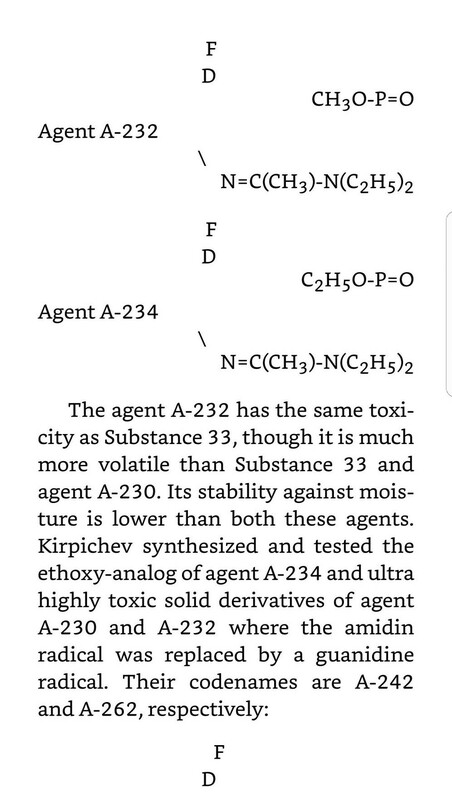 Details on 'Novichok' nerve agents were published in a 2007 book by Vil Mirzayanaov, a Soviet scientist offered asylum in the United States. After the publication the U.S. and the UK actively suppressed international discussions about the book and the 'Novichok' chemical weapon agents. Documents from the U.S. State Department published by Wikileaks show that then Secretary of State Hillary Clinton directed her diplomats to not talk about Novichok and to play down the matter should it arise in chemical weapon control talks. 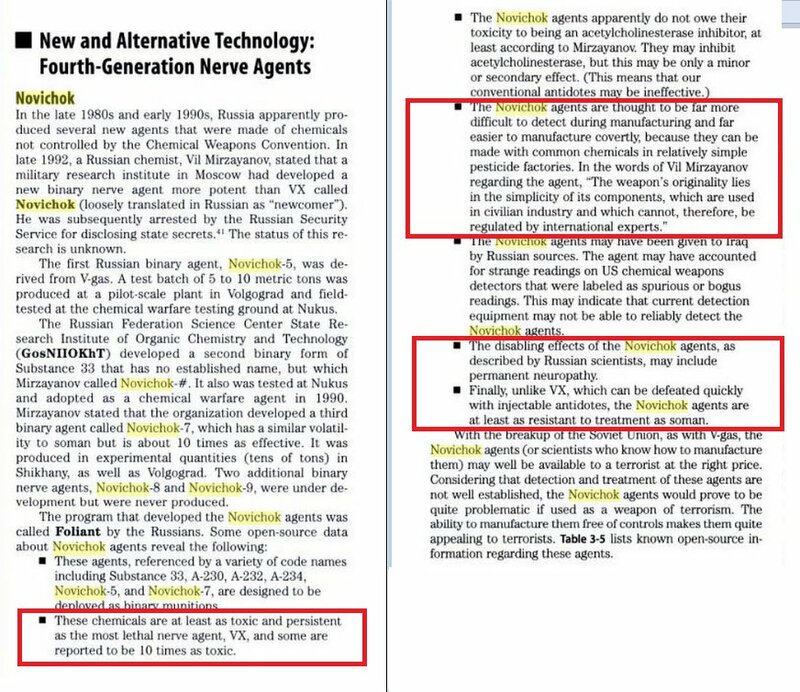 The so called 'Novichok' group of nerve agents were developed in the 1970s and 80s by Pyotr Kirpichev and Vladimir Uglev under a Soviet program codenamed 'Foliant'. Later on the development group handed the project off to Professor Leonid Rink for further developments of the substances into binary agents which would make them usable as military weapons. But the Soviet Union broke down and stopped paying its scientists. Rink secretly produced a small dosage of one of the Novichok agents and sold it to a Latvian mafia contact. In 1995 the poison was used to kill a Russian mobster kingpin/banker and his secretary in Moscow. Rink produced several more doses and sold them. Their whereabouts are unknown but such substances are supposedly unstable and they will likely have lost their effect. Another scientist at those laboratories, the chemical analyst Vil Mirzayanov was tasked with detecting environmental and security leaks from the laboratories. He knew of the 'Foliant' program and the developed 'Novichok' agents. In the early 1990s he blew the whistle about them, was harassed by the state and in 1996 was allowed to go to the United States. There he spilled his beans (pdf) and told the U.S. whatever he knew. In 1997 the Russian Federation and other states of the former Soviet Union joined the Chemical Weapons Convention and destroyed their chemical weapon stocks and production facilities. One production and test facility for the 'Novichok' agents was in Nukus, Uzbekistan. In 1999 the U.S. helped to dismantle that facility. It surely acquired additional knowledge about everything that was produced there. In 2008 Mirzayanov published a book about his story and the chemical agents developed under the 'Foliant' program. The book included the chemical formulas of the agents. Today Mirzayanov lives in a million dollar home in Princeton, New Jersey. The book created new interest in the international community of chemical weapon scientists. People involved with the Chemical Weapons Convention (CWC) and the Organisation for the Prohibition of Chemical Weapons (OPCW) were highly interested in this. Was there really a new '4th generation' of chemical weapons that could be easily made from freely available industrial precursors? Naturally the U.S. diplomats involved in the arms control efforts and in the OPCW were asked about this. 2. 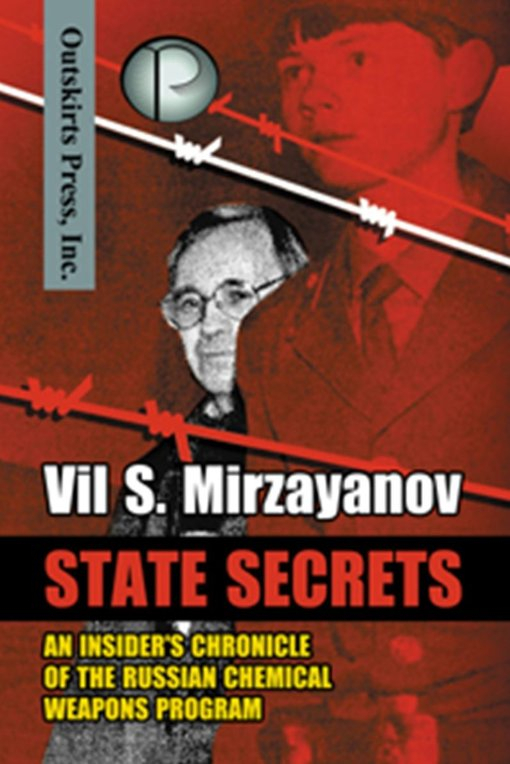 (S) On March 25, in a private conversation, Canadian delegate asked U.S. and UK Delreps whether they had heard of the Mirzayanov book "State Secrets: An Insider's View of the Russian Chemical Weapons Program." Canadian Rep added that Mirzayanov now appeared on YouTube. UK Rep acknowledged she had heard of it, but said this was the first time she had heard of "novichoks" and thought the entire discussion was best left to experts in capital. U.S. Delrep indicated a lack of familiarity with the subject matter and indicated no interest in pursuing the discussion further. 3. (S) On March 4, Delrep met with U.S. Rep to the OPCW Data Validation Group. In addition to a routine report on the activities of the Validation Group the week of March 2, U.S. Rep informed Delrep that representatives of several countries (Finland, Netherlands, UK) had begun discussing the Mirzayanov book on the margins of the meeting. All participants in the discussion seemed to be simply gauging the level of awareness; these same individuals also expressed some doubt as to the credibility/accuracy of the information in the book. U.S. Rep to the Validation Group confirmed that no other members of the group took part in or were listening to this conversation. 4. (S) Del Note: U.S. Del understands from OSD that the UK Ministry of Defense has spoken to its counterparts in the Netherlands and Finland, apprised them of the conversation, and asked each country to provide guidance to its del members not/not to raise this issue in the future. End Note. 5. (S) Action Request: As the implications of this book for the Chemical Weapons Convention (CWC) are likely to come up at future OPCW meetings (particularly technical meetings like the upcoming Scientific Advisory Board meeting 30 March - 1 April 2009), Del requests guidance as to how this issue is to be handled if raised by others. U.S. members of OPCW technical advisory bodies do not necessarily have contact with the U.S. delegation during their time in The Hague; guidance will need to be provided directly to these individuals. 1. (U) This message provides guidance for the U.S. delegation to the Australia Group's informal intersessional meeting in London on April 6-7, 2009. -- Report any instances in which the book is raised. -- Not/not start or provoke conversations about the book or engage substantively if it comes up in conversation. -- Express a lack of familiarity with the issue. 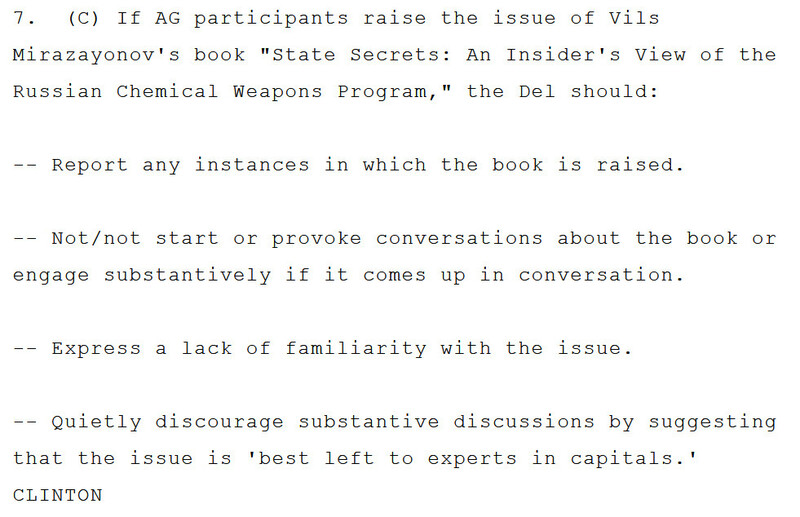 The follow-up U.S. delegation report after the meeting of the Australia Group does not mention 'Novichok' or the book. The issue was kept off the table. The above is not the only involvement of "CLINTON" in the 'Novichok' and Skripal affair. The Hillary Clinton presidential campaign paid the British company Orbis to create the 'dirty dossier' about Trump and his alleged connections to Russia. Christopher Steele, a former(?) MI6 agent, and his former(?) MI6 colleague Pablo Miller wrote the dossier, claiming that its information came from Russian sources. Pablo Miller was the MI6 agent who had recruited Sergej Skripal as a spy for the UK. Miller lives in Salisbury where Sergej Skripal lives and where he and his daughter were allegedly attacked with a 'Novichok' nerve agent. Miller was a friend of Sergej Skripal and regularly met him. It is quite possible that some of the shoddy rumors in the Steele dossier were sourced from Skripal or from his daughter Yulia. The incident in Salisbury could well be related to the dossier or other dubiously alleged campaign issues. It is intriguing that the U.S. and the UK tried to downplay any discussion of 'Novichoks' and the book. Why did they do so? 7. (C) Drawing on the points provided in reftel, del rep met with delegates from the UK (Mark Matthews), Switzerland (Ruth flint), Austria (Hans Schramml) and Czech Republic (Jitka Brodska) to discuss the recent ill-considered comments made by Scientific Advisory Board Chairman Matousek to the Western Group. All of the delegates appreciated the clarification that the U.S. did not develop or weaponize NGA, including "Novichoks." They also agreed with the U.S. that it is a bad idea to have a discussion on whether to add NGAs to the CWC Schedules of Chemicals. Finally, they all also stated that they had not heard of any interest by any delegation in pursuing such an effort, and the issue has not/not resurfaced in WEOG. Jiri Matousek, a Czech scientist leading the SAB, was told to shut up. A U.S. diplomat contacted the Czech government and later reported his success. The headline of his cable is telling: MTAG: CZECHS MUZZLE ADVISORY BOARD CHAIRMAN ON NEXT GENERATION AGENTS. It is clear now that the professed ignorance of the OPCW about 'Novichocks' was a consequences of U.S. and British pressure to discourage any discussion of the issue. In 2016 a group of Iranian scientists synthesized five 'Novichok' substances. It devised ways to detect them. The results were published and added to the OPCW database. The British government insinuates that Russia is the only country that could make 'Novichok' agents and must therefore have attacked the Skripals. This is obviously nonsense. The U.S. and the UK were deeply involved in the 'Novichok' issue. They certainly tried and succeeded to re-create these substances. After the formulas of the nerve agents were published by Mirzayanov the U.S. and the UK suppressed discussion of the issue. The OPCW professed to know nothing about them. Only after Iranian scientists independently re-created the agents and published about them were they added to the OPCW database. Why did the Clinton State Department and the British government suppress international talks about the 'Novichok' agents? Why did they try, successfully it seems, to keep the issue out of the OPCW's Scientific Advisory Board? Why were the substances kept out of the OPCW database until independent Iranian scientists finally re-created them? As though in confirmation, the so called "government of Tatarstan in exile" was formed in the United States in December 2008. It is headed by US citizen Vil Mirzayanov, a Russian scientist granted political asylum in the United States. Along with Mirzayanov himself, the alleged government includes two Germans and a Turk. This self-proclaimed government already appealed to the UN to recognize independence of Tatarstan in the manner sovereignty of Kosovo, Abkhazia, and South Ossetia had been. Vil Mirzayanaov signed the bombastic Declaration of Independence of Tatarstan. But as far as I can tell nothing significant came out of the 'Independent Tatarstan' project. In 2014 the U.S. and Turkey used groups of jihadist Tatars they had trained in their unsuccessful attempts to gain control of Crimea. These issues could be related.